We’ve all seen the Mini Coopers with Red Bull cans and collateral wraps tooling along the veins of the city, but now JMR Graphics and ComTrans of Phoenix are conspiring to sell ad space on fleet vehicles, continuing the advertising juggernaut’s intrusion into every sensory input to our consciousness. 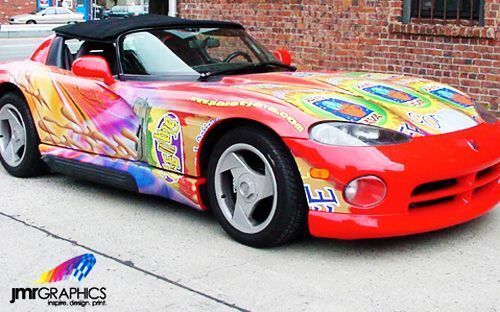 JMR Graphics has been an award winning US 3M Certified provider of large scale graphics for over a quarter of a century, specializing in fleet graphics, vehicle wraps, architectural wall graphics, promotional window clings, floor graphics, event signage and much more. They provide changeable, short or long-term application products for most any purpose with a warranty backed by 3M. As a total service company, they can supply creative design as well as custom printed graphics and work with a network of installers nationwide. ComTrans tested vehicle wraps on its fleet for four months before deciding go forward with offering the advertising medium based on its effectiveness. “At this point, I think we have a very good product to offer,” said Cyndi Cross, Executive Vice President for ComTrans. “We have great visibility for people,” however the image must be striking and the message simple. Due to the lack of a corresponding soundtrack or animation, wraps must be visually compelling to get a viewer to seek more information on or patronize the advertiser. Thank Heaven no one’s invented a way to place ads into our dreams – but someday they probably will. In psychology classes they teach that constant stimulation is no stimulation at all. In other words you get used to it and then don’t even perceive it. One day the total onslaught of advertising may be so constant, we may become totally unaware of it. Perhaps then, we won’t even talk to each other unless we are trying to sell something. Streets, buildings, lawns, zoo animals, and human bodies – one day they will all have ads on them – there’s simply no escaping it.